Knowing how to make checkboxes in Excel 2011 for Mac is a handy bit of know-how. Check boxes appear in all kinds of forms, such as surveys and questionnaires, where you choose from multiple answers. 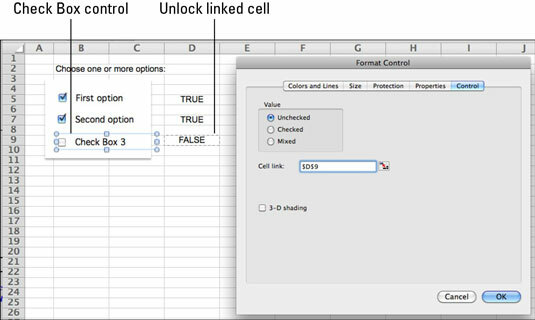 In Excel 2011 for Mac, each check box control is linked to a cell on your worksheet. While your form is unprotected, click the Check Box control on the Developer tab of the Ribbon. Drag diagonally and then let go of the mouse. A check box appears and is selected on your worksheet. Right-click the new button and choose Format Control from the pop-up menu. On the Control tab of the Format control dialog, set a cell link by clicking into the empty Cell Link field and then clicking a cell on any worksheet. The linked cell is indicated in the Cell Link field in the dialog. The control won’t work when you protect the worksheet unless you unlock the linked cell. Adjust other formatting options as desired. Repeat Steps 1 through 4 for each Check Box control you want to add to your worksheet. To prevent a user from tabbing into a linked cell, put the linked cell in a hidden row or column, or on another worksheet. Click OK to close the Format Control dialog. When the check box control is selected, the linked cell’s value is TRUE. When the control is deselected, the linked cell’s value is FALSE. You can set the initial value in the Format Control dialog. If you choose an initial setting of Mixed, the linked cell’s value displays #N/A until the check box is clicked in the form. The default text when you make a check box is its official name, which will be something like Check Box 4. Change the default text by clicking into the text inside the control and then dragging over the text to select it. Then type replacement text. Typing replacement text to display does not change the control’s name.